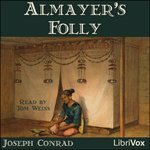 Almayer’s Folly is about a poor businessman who dreams of finding a hidden gold mine and becoming very wealthy. Kaspar Almayer is a white European. He agrees to marry a native Malayan captured by Captain Tom Lingard, his employer, believing the marriage will bring him riches even though he has no love for the woman. They have one daughter named Nina. Almayer relocates with his wife to Malaysia where he hopes to build a trading company and find gold mines. His hopeless daydreams of riches and splendor cause his native wife to loath him. Almayer, desperate, hopes to find his salvation in Dain Maroola, a Malayan prince, who arrives on the island one day. Maroola agrees to work with Almayer and Lakamba, the Rajah, to send an expedition in search of the gold mines. In fact, Maroola is interested only in Nina with whom he has fallen in love. They plan to secretly leave the island. I can’t tell you more, or I would spoil the story.